A Comprehensive Review of Dr. Phil’s 20 20 Diet. I just finished reading Dr. Phil’s 20 20 diet book and have to say for the most part, it has a lot of very interesting facts that will be profound for most dieters who are only used to a traditional way of losing weight. I do like that he mentioned a lot of unorthodox concepts that aren’t mainstream such as eating foods that make you feel fuller as well as other important concepts. I knew about them before, but now that someone like Dr. Phil mentions them, it’s high time they received their long overdue praise. I’ll be going over these things as well as providing a fully comprehensive review of the 20/20 diet, the foods within them, sample meals and much more. It’s a 3 phase diet (really 4 if you count the after diet plan) which lasts for 30 days. The first 2 are 5 days long and the third is 20 days. The foods you eat are supposed to help with thermogenisis which is a state where the body just increases fat burning & metabolism. One thing Dr. Phil is careful about saying if it’s guaranteed to do what it’s supposed to. He just uses the word “May”. The concept of the 20/20 diet isn’t really the foods you’re eating, but the overall picture Dr. Phil tries to paint which is looking at past mistakes we have made in our dieting efforts, with failed attempts, lessons learned, and in hindsight taking that and making up for it. That is what the 20/20 aims to do, to make what right what we’ve been doing wrong this whole time. Dr. Phil really goes deep into explaining why other diets have failed using 7 examples of what other diets cause such as hunger, cravings, temptations and other negative effects which ultimately lead to failure. He even bolds the failure part (at least in the kindle edition). These failures are what eventually led him to create this diet plan which is “fail proof” against those 7 failures. As for how much weight you can lose, that’s not exactly mentioned. What is given is a table with a list of heights and how much you should weight based on that. That is supposed to be your target weight. Now with that out of the picture, I’m sure everyone reading this is “dying” to know the 20/20 foods and what makes them so special. Coconut oil, Green tea, Mustard, Walnuts, Olive Oil, Almonds, Apples, Chickpeas, Greens from vegetables as long as they are leaf like (cabbage), Dried plums, Lentils, Peanut butter, Pistachios unsalted and roasted, Raisins, Cod (fish), Rye, Tofu, Whey protein. Note: These aren’t the only 20/20 foods! The ones above will be used entirely during phase 1 as you’re about to learn and in the following phases, including the post diet phase. There will be many more foods within this diet, as well as recipes and they will also be counted as 20/20 foods. Info on the recipes can be found here. Now let’s see how these foods are going to apply to the actual diet. Basics: Lasts for 5 days and you eat 4 meals, 4 hours apart. The foods you eat must contain the 20/20 foods. You are given recipes where multiple foods from the 20 above are put together. For example: Apple walnut parfait, apple peanut butter and many, many more. In terms of drinks, green tear, water and lemon juice is allowed. It is important to eat within the confines of the list. As you get into the next phases, it’ll become much more flexible. Chicken breast, tuna, black beats, oats, brown rice, corn, carrots, tomatoes, mushroom, cashews, blueberries and more. Again you are given a lot of recipes to combine these foods with phase 1 foods. The same rules apply here in terms of eating 4 meals, 4 hours apart, everyday. You should eat until you almost feel full each time. Avocado, raspberries, strawberries, tangerines, peaches, oranges, limes, bananas, cauliflower, mushrooms, onion, parsley, yogurt, potatoes, spinach, quinoa, pita whole grain, black beans, cannelloni beans and more. This is the post diet part where you should maintain a lifestyle change. Basically you continue to eat in a way you’d eat during the 3rd phase. You should aim to eat from the food list provided, including when you go out. Rules for going out to eat: Dr. Phil provides a list of different restaurants and examples of how you should be eating. Basically you can eat whatever you like, but try to order dishes/drinks that include the foods from the 20/20 list. There is a “30 second” exercise plan added into the book where you do HIIT exercises. There is a large list to choose from, with things such as squats, dumbbell and other weight like exercises, but the point is that you do them in turn. So you can work for 1 minute, then do 30 seconds of as many exercises from the list as you can, then rest, then go back to regular training, then again for a 30 second explosion. If you can’t do these exercises, then just do more walking instead of using escalators or vehicles. Run more than you walk (you can also do the 30 second bursts like this). Just basically move more than you sit. Dr. Phil talks about NEAT which is an abbreviation for thermogensis where you simply burn calories by doing very small things such as brushing your teeth, walking, chewing, ect… This isn’t anything special. It just means, be more active and the calorie burning will add up. The approach to dieting in this plan is pretty flexible. The hardest parts are the first 5 days. Not much restriction on carbs which makes it more manageable. The diet is pretty short. Doesn’t use traditional approaches to weight loss. A huge bibliography is cited at the end of the book giving credit to the claims in it. I don’t like that Dr. Phil uses the word “may” so often. It seems like he’s being politically correct. A lot of very basic things are mentioned in more complex ways (NEAT) to seem like they are more than they really are. Just move more to lose weight! How much clearer can you get? This plan is good, but it’s not overly good either. Focus is more on gradual weight loss so if you need fast results, this might not the option for you. The exercises will help boost results though, just not by that much. Health wise, the plan makes a lot of sense and I like how Dr. Phil talked about changing your though process on weight loss. To eat for nutrition, not to full fill an emotion as he mentioned using an example of a person who broke up with her boyfriend who begins eating ice cream to calm herself down. This is not how food should be treated. In the end if you do this diet, you will lose weight. But I don’t know if you’ll be able to keep up with the 20/20 food implementation for the rest of your life, even though there are a lot of choices. If you can do it, good, but make sure that most of your food consumption comes from that list, otherwise your weight might return. A year ago, I lost about 15 kg before my bodybuilding competition. I know how hard is to lose just one kilogram even grams. but now I gain extra kilos after the competition and I want to lose it again for my wedding next summer. I like the idea of the 4 phases and I want to try it. do you try it? I’ve eaten a few of the foods from this diet plan Amir, but have not done the plan. What I stick to most is eating things with high fat as recommended by this book that I think may suite your dieting goals. 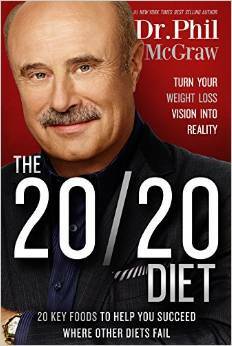 Wonderful summary on Dr. Phil’s 20/20 diet, while I agree with most of it. The practicality of maintaining such a routine life-long makes it tough. I wonder if it would help readers if you inserted some comments or website links about “mindset”. Most people that are able to sustain changes to their diet and lifestyle are pretty determined people. Their mindset is fixed and they are able to say ‘no’ to temptations (food) more than the average person. In addition, the exercise regimen doesn’t seem to be sufficient, perhaps suggestions or links to more HIIT workouts or programs could help as well. Very interesting piece on the 20/20 diet vitaly. It all seems to be over complicating what should be a simple concept to me though? I do like the fact that the book features a section on the psychology of weight loss and that in the last phase it should become a permanent lifestyle change. That to me is what is most important, making a commitment to a healthier lifestyle. My sister and I both did, and still maintain, the 20 20 plan. My sister lost 15 pounds, and I lost 35. Have been successful at keeping within a 3 pound up or down range and couldn’t be happier with the plan. Admittedly, some of the recipes were not palatable but there were more to choose from to make it work. As with any diet change there’s an adjustment period. You get used to it I suppose. I’m into a clean eating healthier lifestyle and I love it. At 57 years of age I was finally successful at losing the weight, exercising regularly, and maintaining. I WILL not diet again! I’m in the first day and yes, the first 5 days will be the most difficult. My issue is the recipes, finding the ingredients and the foods are really the same 5 main ingredients in all meals with an emphasis on garlic, mustard and lemon juice. I’ll let you know how it goes. I agree Dawn, in those 5 days, most of the choices are just going to be those single foods from the list. It’s sort of like a crash period in dieting for these days, but after, you should be able to get through way easier. Actually read this book a few months back – not bad at all with some interesting concepts. It gives a comprehensive plan for lasting slimming. The biggest pro ( I thought ) is the behavioral changes that Dr. Phil introduces. He also covers a lot on the mindset needed to succeed – your review seems to cover all these aspects so spot on! I was going to buy this book because I really like Dr Phil, but thanks to your review I think I might not. I am looking for a diet that will have a fast impact and from the information you have written in your review it looks like the 20/20 diet isn’t going to be a fit for what i want. Thanks, a very thorough article. I don’t know what’s going on here. Ok so I bought 20/20 8 months ago, never even opened it. Well now I am committed and have opened it, both my husband and I are totally committed. I went grocery shopping for first week. Well then it’s now time to eat those first weeks of food, ok I could not even complete the 1st day. How on earth can you eat that 1st week of food, it is gross. I really want to do this however we can not get this 1st week of food into us. Hi Sherry, there are foods many people might not like in 20/20, but that’s how it’s set up. If you can’t eat those foods, you can either just eat less or try another diet that contains foods you are OK with eating. I think the 3 week diet may be better, but learn about the plan first. My husband and I are on Day 9. We have both lost weight and we really like all the recipes. We think it’s pretty easy plan to follow and the foods are good. Wow! What an extensive review of Dr. Phil’s 20/20 diet. This diet seems to be fairly plentiful in as far as being able to be four meals a day. I think that’s a bonus for anyone who’s currently eating only three meals a day. I, as I’m sure many others, don’t care for diets that have a lot of weird food on the “A” list. I don’t want to have to make a shopping list for my diet and then another shopping list for the rest of the family. It seems most of these foods will be enjoyed by the whole family. I love the idea of a” 30 second” exercise plan as well. Who wouldn’t, right? Although I’ve never been a fan of Dr. Phil, I might just give this diet a try. Thank you for this review. I have to agree with you that this plan does seem kind of basic, but also useful for those who are just starting out switching over their diets. It’s a gradual way to change eating habits so that is kind of cool, but not for someone who is trying to see fast results. Nice review! What a helpful article, I just bookmarked your website so I can read more interesting articles. I did a lot of diets in the past and one of my biggest mistakes was that I wanted to lose weight very quickly. I’ve succeeded in that, but I was gaining all the weight back fast as well. I never heard about Dr Phils, but without a doubt, I will definitely read about him. thanks for the review of Dr Phil’s 20/20 diet. Seems like it would be easy for me to follow as most of the foods from his plan I eat regularly anyway, would just have to cut out some of the junk. Might not lose weight as fast as some of the other diet plans out there, but on thing I’ve noticed is the quicker i lose weight the quicker i put it back on aswell. Gets its down to personal preference. I have never looked at the online app version of this diet Melanie, but I can see how this can confuse you. I think they made a mistake when making these recipes and a list of foods to eat and just didn’t think about if it will contradict the 20/20 foods. I believe if you eat most of the foods from this diet and make it the major part of your diet, you will see the results. If you can ignore some of the foods that contradict the diet, do that too. How have this diet worked for you so far? Also, you would probably have a much easier time with the 3 week diet instead. It’s more careful on this. I’d heard of Dr Phil but I think he is based in USA isn’t he and I understand he is on the TV a lot talking about various diets and health issues. Anyway, you have gone through very thoroughly what Dr Phil’s 20/20 diet is about and I’m not sure I could stick with it for too long. Yeah, that diet will be easier Ches. Dr.Phil is from the US. I don’t know if you’ll be able to see his show on TV in the UK, but there maybe recordings of it on different websites. Thanks for the comprehensive review. Have you tried the regime in this book and did it work? The biggest thing about dieting is having the right mindset. At least this book tries to look at why people fail, which puts the whole diet into a nice context. Having it structured is also a great plus. If you hate the first week then at least you know that’s it’s only a week! For me this looks like a pretty good way to lose weight. I like the physiological element to this diet: to eat for nutrition, not to full fill an emotion. Exercise is great too, as your abs will only start to show after the body fat fades. I think losing weight gradually is the best way, don’t you think? If you lose it too fast, don’t you put it back on just as quick? Losing weight fast can have that back effect. It happened to me when I did the master cleanse, but gradual weight loss is always the better way to do it. Hello just like to say there are many diets out there and thanks to your website pointing the way to good weight loss programs.The Dr Phil 20/20 weight loss program seems good also but only for gradual long term slow weight loss. I need to lose weight loss quicker and the you recommend on your link on how to drop 23 pounds of fat in 21 days is what i’m thinking of doing. Great review of the 20/20 diet. I like the fact that Dr. Phil tried to create something that would miss all of the triggers of “diet failure” that people so often run into. Also, nice job comparing the diet to other diets out there. I think that it gives the review some more depth to see how it holds up when tested against others. This is a thorough review of Dr. Phil’s Book. I have heard about it but haven’t had time to go get it and read about it.But from your review of this book, i have gotten a clear perspective of what the book is about.